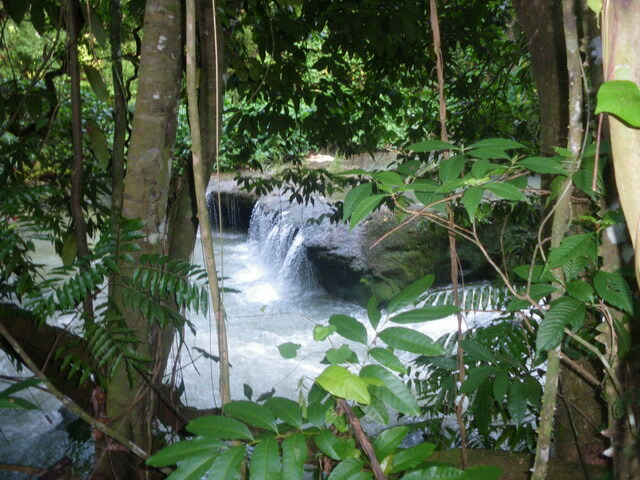 Without reservation I can say that YS Falls is one of the best places to spend a day in Jamaica. Found on a former logwood and cane farm,it's tucked away in the innards of St. Elizabeth. Surrounded by green, green fields with magnificent guango trees, thoroughbred horses, and by the look of them, thoroughbred cattle! The experience starts with the road that gets you there. You turn off the Santa Cruz to Black River main road at an overpowering roadside cookshop called Howie's. After a minute or so you leave the chaos behind, and you begin to feel different. You're on this bumpy backroad that's lined with the tallest logwood trees I've ever seen. It's beautiful on that road. Fresh, green, calming. After getting to the ticket office/bookshop/bar/grill area, a scenic jitney ride (hang on tight) takes you up toYS Falls themselves. After you spend a few moments taking in the wonder of the waterfalls, you'll realise there's something there for everyone. You can swim in the pools at the bottom of each cascade. There are wooden steps to the side of the falls that you can use to climb to the top. Or swing jungle-style from a looong rope and splash feet-first into the falls. If you want a little less action, hang out by the most natural man-made pools, fed by water from the falls. My kids happily spend hours with their friends in those pools. last-action-heroes can take the high speed canopy ride above the falls. The grounds define the word "lush", and there are picnic tables dotted here and there, with a playground for kids nearby.If you don't want to get wet, lazing around the grounds with a choice book (there's a good selection in the giftshop on site) and your camera makes for a pleasant day. You can sip coffee, beer or whatever, watch the hummingbirds, and laugh at the grown men screaming when they first hit the cold water. Visit the official YS Falls website for more information on pricing and opening hours. I used to visit YS as a teenager before it was open to the public, riding in the back of my brother's pickup, walking when the trail wouldn't allow us to drive. We had to open the gates between the cow pastures, closing them carefully so as not to disturb Mr. Browne's cows. Just a handful of us and a whole lot of nature. A lot has changed since then, but the owners of this attraction have done a thoughtful job in maintaining a balance between nature and human comforts. Despite the fact that tours from large hotels make frequent visits, I've never felt overwhelmed by a crowd. It seems to me,though, that some of the tours are too rushed, not giving enough time for real relaxation and enjoyment. That's why I'd suggest staying somewhere in St. Elizabeth, where you can have at least a day at your disposal. If a short tour is the best you can do, then by all means do it, because YS Falls is not to be missed.